“Thank you, Linda, for that kind introduction. And thank you for all the work that you, Dennis, and Doug are doing to grow Linn County’s economy through trade and investment. Thank you also to Cornell College for hosting this important event. “In a sprawling book of over 800 pages, those words stuck with me for two reasons. First, Cedar Rapids has become a populous center of trade, having exported nearly $900 million in merchandise during 2012. Second, towns like Mount Vernon are a testament to the fact that Iowa’s economic rise has not come at the expense of its character. “That conviction—that we must advance both our interests and our values—is at the core of President Obama’s trade agenda. And nowhere is that commitment more evident than in the White House Rural Council’s ‘Made in Rural America’ export and investment initiative. As part of that initiative, it’s a privilege to join you today for the third of five regional forums organized in collaboration with the National Association of Counties. “Many of you are here to decide whether exporting should be the next step for your farm or small business. Others are already exporting and will be sharing their experiences with us today or learning how to further bolster their sales to foreign markets. We’re brought together by a shared appreciation for rural America’s importance to the greater U.S. economy and by the economic opportunities that exist outside our borders. “In recent years, Iowa workers, farmers, and businesses large and small have been a leading example of how trade creates better jobs and drives economic growth. As the second-largest agricultural exporter in America, Iowa has been a key contributor to the roughly 40% increase in U.S. agricultural exports since 2009. That includes last year’s national total of nearly $150 billion in agricultural exports—the highest in U.S. history. And, thanks to Iowa, we are on track for another record-setting year. “Of course, the best part about these records is that the success is shared. Across America, our exports last year supported more than 11 million jobs, and increase of 1.6 million jobs since 2009. Agricultural exports alone supported nearly 1 million jobs, and we know that on average, export-supported jobs pay 13-18% more than non-export supported jobs. We also know that agricultural exports create positive ripple effects throughout the economy as value is added at each step between the farm and the table. In 2012, every dollar of agricultural exports stimulated another $1.27 in business activity. “Among these numbers are millions of farmers, manufacturers, and small businesses, many of them in Iowa. In 2012, more than 3,300 Iowa companies exported, and more than 80% of these companies were small businesses. “I’ll be visiting some of these small businesses during my stay in Iowa, including Kimberley Family Farms, which is based in Maxwell. Coming from a line of farmers and ranchers that goes back to the 1850s, the Kimberley family has incorporated best practices, such as no-till farming, for soybeans into their farming. Today, Kimberley Farms has a total grain storage capacity of roughly 400,000 bushels in 5 different sites, and it exports soy and corn to Asia. “I’ll also visit Kemin Industries, a Des Moines-based company that manufactures over 500 specialty ingredients for the global feed and food industries, as well as the health, nutrition and beauty market. Kemin’s products reach over 2 billion people across more than 90 countries. The innovation behind Kemin’s success shouldn’t come as a surprise. After all, there’s a long-list of famous brands with Iowa roots, including Maytag, Stover, Chrysler and others. “Yet another example of how Iowa’s innovative small businesses are growing through exports is the story of Think Safe, a Cedar Rapids-based first aid and safety company. 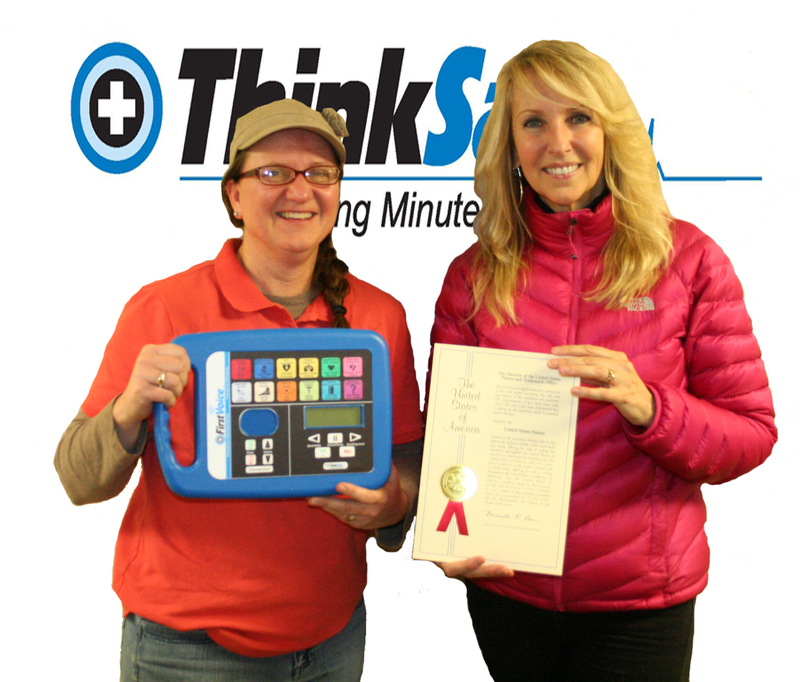 Think Safe was founded in 2004 after a former flight nurse for St. Luke’s Hospital identified the need for a product that could offer first aid instructions to untrained people during rescue situations. Earlier this year, Think Safe received a patent for a device that does just that, and today, its products are sold to distributors in Africa, the European Union, Mexico and Canada. “And by all indicators, trade is only growing more important to Iowa’s economy. According to a recently-released ranking by the U.S. Chamber of Commerce Foundation, Iowa is 7th in the nation in export intensity growth, meaning that exports are growing to contribute an even greater share of Iowa’s GDP. And during 2011, one-quarter of all manufacturing workers in Iowa depended on exports for their jobs. “Through President Obama’s trade agenda, we’re working on multiple fronts to help lower barriers for U.S. exports so that more American businesses can export and those who are already exporting—like Kimberly Family Farms, Kemin Industries, and Think Safe—can export more. These are 3 of the nearly 300,000 U.S. small businesses that currently export, and with less than 1% of all businesses currently exporting, we have a lot of room for growth. “That’s why we’re negotiating ambitious, next-generation trade agreements like the Trans-Pacific Partnership, or TPP. When completed, TPP will lower barriers for U.S. exports to the world’s fastest growing region, representing 40% of the global economy, including three of Iowa’s four biggest exports markets: Canada, Mexico, and Japan. As the economies of the Asia Pacific grow, incomes rise and middle classes emerge, more and more people will be looking for better, safer, more diversified diets. “These shifting consumption habits will continue driving demand for meat, dairy, organic, and other ‘Made in Rural America’ exports. “Our discussions in TPP are also aimed at setting high standards across a range of issues that will level the playing field for American workers and businesses. We’re doing this not only because promoting fundamental worker rights and protecting the environment is consistent with our values, but also because we know that when global competition is fair, America’s workforce and businesses—the most productive in the world—win. “We’re also unlocking opportunities for “Made in Rural America” exports in America’s largest market: the European Union. “Through our negotiations in the Transatlantic Trade and Investment Partnership, or T-TIP, we’re knocking down non-tariff barriers that have prevented some small American businesses from competing in the European market. T-TIP will also enhance market opportunities for a number of goods that Iowa is already exporting to the EU, including soybeans, animal feeds, pork and other livestock products. “In parallel with our T-TIP negotiations, we are working to remove unnecessary regulatory barriers affecting agriculture exports. Last year, the Obama administration resolved nearly 200 trade-related barriers involving U.S. agricultural exports, including resolutions that helped increase total U.S. beef exports by 12% and U.S. pork exports to Colombia by 63%. And we’re continuing to make progress on these issues. “When completed, TPP and T-TIP will give us free trade with almost two-thirds of the global economy, and the United States will be at the center of that economy as the world’s production platform of choice. More businesses will want to move their operations to the United States to take advantage of our talented workforce, abundant and affordable energy, dependable legal system, and all the other qualities that make America great. Farmers, ranchers, small businesses, and other will grow it here, raise it here, make it here, and sell it all around the world. “We’re also standing up for American families, farmers and businesses by vigorously enforcing our existing trade agreements. This administration has made enforcement a top priority, and its track record in upholding the rules-based trade system is second-to-none. “We have brought 18 disputes in the World Trade Organization, and having won every dispute decided so far, we’re on our way to creating billions of dollars in additional opportunities for U.S. exporters. “At the end of the day, all of these efforts—opening new markets, deepening our existing economic ties, resolving unwarranted barriers, and enforcing our agreements—create opportunities, but it falls on each of us to seize them. The idea of exporting to Asia might seem daunting, but you’re not alone. As you’ll hear more about today, there are a number of local, state, and federal resources available to help you tap into the 95% of consumers and 70% of the world’s purchasing power that exists outside our borders. Together, we can make those opportunities a reality. To find out more about Think Safe products and how to become a U.S. dealer or international dealer, please complete the following form. Pet First Aid and CPR Training – Keeping Our Pets Happy and Healthy! First Aid Funny – Cat CPR! Is this really how to do Cat CPR? What is Pet First Aid and CPR training and why do I need to know about it? First aid is literally (definition): aid or management that is rendered as soon as a problem is identified at the scene of the injury or illness by those first to respond to a problem until the time when professional care is provided. Many people confuse first aid with specific “specialized advanced (veterinary care) treatments” for illness or injury. First aid care is important for you to provide BEFORE getting to the vet as delays in simple basic care are proven to create more adverse long term health problems or death for your pet. Don’t be left unprepared when caring for your four-legged family members. When your pet is injured or ill they cannot tell you what is wrong, which is why it is vital that you learn signs and symptoms of pet illness and injuries and what should immediately be done. Learn steps to prepare for emergency situations, to ensure you are ready for any of life’s unexpected events. Pet first aid courses are available to teach you basic pet care, CPR, rescue breathing, Heimlich maneuver, and many vital steps to take in saving your pets life. Learn how to respond to health emergencies and provide basic first aid for the four-legged members of your family. Practice and preparation will help you be calm and effective in an emergency, protecting you and your animal from further injury or suffering. Why Choose Think Safe’s First Voice Pet First Aid & CPR Course? Think Safe’s Pet First Aid & CPR Course has been updated with the latest recommended guidelines outlined by the first evidence-based research on how best to resuscitate dogs and cats in cardiac arrest, published in June 2012 by the Reassessment Campaign on Veterinary Resuscitation (ROVER). Now, with the most up-to-date course on the market, the First Voice Pet First Aid & CPR Course, being prepared is as simple and easy as turning on your computer in the comfort of your own home. If you’re already CPR certified, online Pet First Aid and CPR training is a great addition! Check out our value-added Pet First Aid Kits – both Basic and Deluxe versions – to supplement your first aid knowledge! For more information, or to purchase the training and/or kit, please complete the following form or contact Think Safe at 888-473-1777. Think Safe, a Cedar Rapids, IA based company and homegrown Iowa business that started from scratch, based upon the idea of an Iowa citizen, received its first patent in early 2014. The idea formed what is now known as an Emergency Instruction Device (EID), a technology product being marketed all over the US and in other countries. On February 11, 2014, US Patent8,647,123 was issued and assigned to Retrac, Inc. (now doing business as Think Safe Inc. in Cedar Rapids, Iowa) and company founders and inventors. The EID patent is a major milestone for Think Safe, which was originally founded in 2004 centrally focused on the idea of the EID. The EID is often called a CPR & First Aid Assistance device, first aid tablet or talking first aid book and is the only dedicated technology device on the market today that offers first aid and CPR instructions to minimally trained or even untrained people during workplace or public rescue situations. 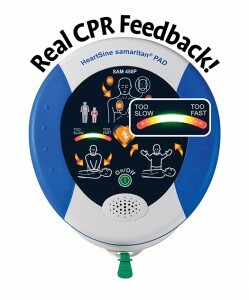 Key details of product functionality include American Heart Association compliance to cognitive feedback device recommendations, as seen here: http://www.firstvoice.us/Products/FirstAidCPRAssist/tabid/790/Default.aspx. The idea behind the EID product was conceived by Annette Carter, a former flight nurse for St. Luke’s Hospital, to bring resources and knowledge during critical gaps in time between when a trauma occurs and when advanced medical help arrives. Annette, during her long career of pre-hospital trauma care, saw how such a device could help make a difference. Today, the Think Safe logo is “Making Minutes Matter” to emphasize the foundation values that remain important to the company going forward. The EID and responder kit systems that can be bundled with the EID provide not only essential and organized medical supplies, but also audio and text instructions to coach people through emergency situations until help arrives. Annette’s vision became a reality with the help of several co-inventors listed on the patent: Paula Wickham , Kirk Dighton, and Troy Mundt, who all served various roles in pre-market research or market introduction and sales or distribution of the EID. The device has been beneficial during many lifesaving situations and testimonials shared by clients, and has had key endorsements in its short lifespan to date (click here for more details). The EID or “first aid tablet” can guide people through any major or minor first aid emergency and giving reminders or when to: call 911, check scene safety, use personal protection, provide treatment instructions including information on what not to do, or what to do after the incident, including key tips on information record keeping or scene cleanup procedures. Since its’ invention, the EID functionality has been converted to software that can work with any computer or technology device with WiFi access or downloaded software (ResQr) developed by Think Safe. However, the EID continues to be Think Safe’s signature technology product and the company is proud of the lives it has helped to save as well as the awards we have received that showcase the innovation of the company. 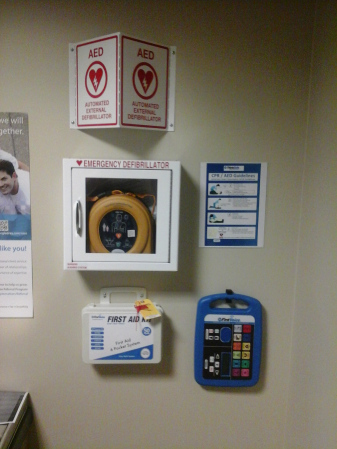 The EID is often paired with various specialty first aid or responder kits or an Automated External Defibrillator (AED), depending on risks that exist at the client’s organization or workplace. 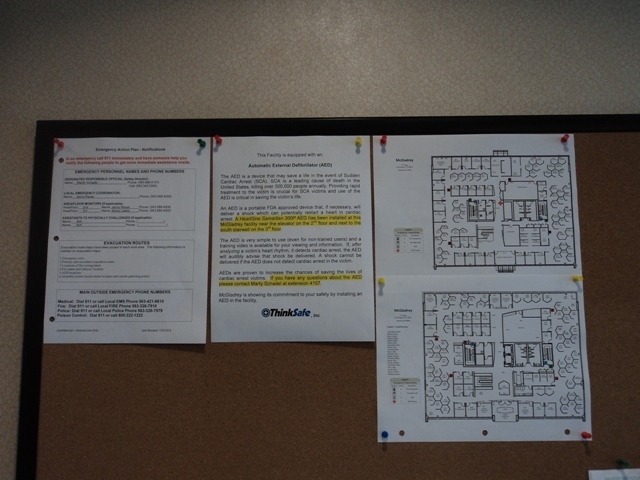 Think Safe is an established manufacturer, wholesaler, training services provider, and overall integrator, bringing clients the products and services packages that they need or want to help mitigate risks, decrease panic, and provide confidence during emergency, first aid, or medical illness situations. The device even allows for users to switch languages mid-instruction for translation of instructions to any other languages also on the EID. In the United States, the device is sold with English and Spanish as the key default languages. Think Safe has other patents that are in process and has already filed continuations on the existing patent that protects additional product developments and other unique features of the technology offering. “You can expect to see more patents issued to Think Safe as the company matures and our product offerings mature and grow in popularity and change based upon customer needs or desires”, states Paula Wickham, Think Safe President. Think Safe is committed to using technology to develop, manufacture and provide innovative products and solutions which improve training and access to CPR, First Aid, and other essential care during emergency situations, setting new standards for comprehensive emergency readiness and response. 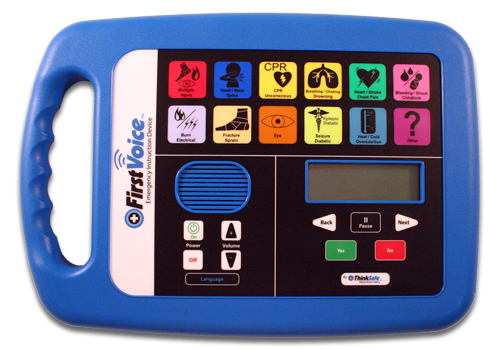 We manufacture innovative products for first aid technology and are a major wholesaler for devices like our First Voice Emergency Instruction Device (EID) and all brands/makes/models of Automated External Defibrillators (AEDs), including services that make things easier for our dealers and customers. Think Safe’s products are available under the First Voice product line brand name, ResQr, or RescueMate brand name in various countries today. Think Safe primarily sells the First Voice product line through established distributors or dealers and continues to selectively add new dealers, based upon geographic area or industry focus of the dealer. Check out our http://www.think-safe.com or http://www.firstvoice.us websites for more information on the products outlined on this blog post or other products and services developed by Think Safe to include: First Voice AED online web-based program management software and First Voice Compliance Management System Software (SaaS offerings); First Voice AED program medical oversight services; First Voice or American Heart Association First aid & CPR training (online Elearning, blended learning, or in-person instruction); and other safety-related products and services. For more information on the Think Safe EID, check out the product on our website or fill out the form below! The Veterans Memorial Health Care Foundation gifted defibrillators to many local law enforcement officials last week following the successful community direct mail fund drive held last fall. Each Allamakee County deputy as well as the Monona Police Department received a defibrillator for their vehicle to ensure CPR and defibrillation is quickly accessible in all sections of the Veterans Memorial Hospital service area. 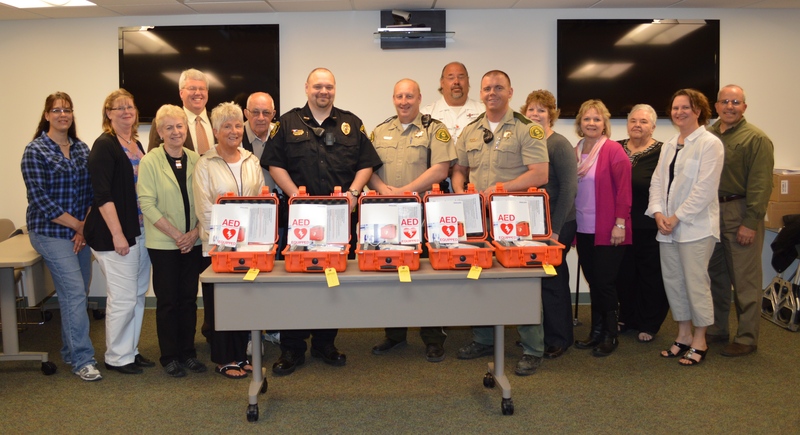 Pictured, in front middle receiving the defibrillators are Brian Berger of the Monona Police Department; Clark Mellick, Allamakee County Sheriff, and Barry Olson, Allamakee County Deputy. Also pictured, left to right are Veterans Memorial Health Care Foundation members Amy Cote’-Hill, Lori Bahr-Stevenson, Nona Sawyer, Craig Lensing, Gloria Krambeer, Wayne Burke, Jeff Mitchell, EMT-P, EMS Supervisor, Veterans Memorial Hospital, Jackie Halverson, Nancy Schoh, Jane Dietrich, Paula Kerndt Wickham, President of First Voice who supplied the defibrillators, and Dennis Lyons also of the Foundation. 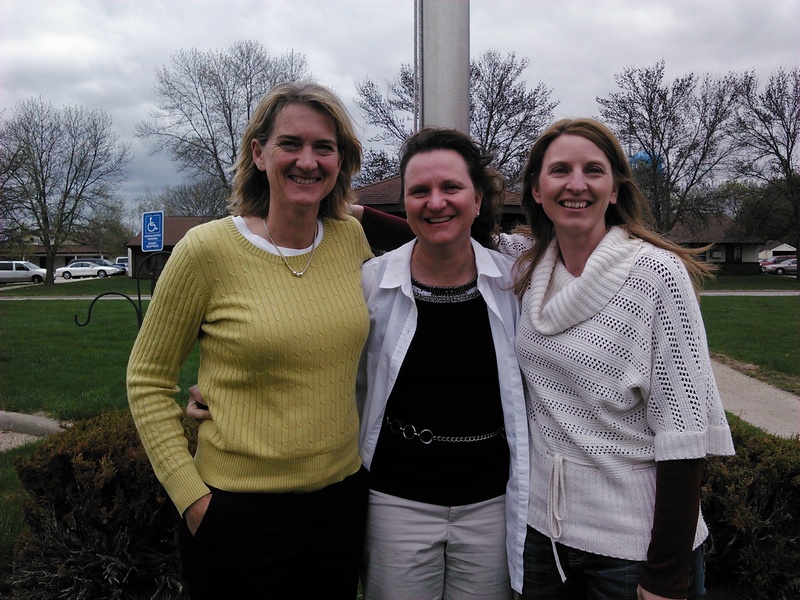 Waukon, IA-May 13, 2014- The community of Waukon, Iowa and surrounding areas are now equipped with new lifesaving devices. Philips Automated External Defibrillators (AEDs) were installed in various locations throughout the community and to local law enforcement and public safety officials, thanks to the direct mail fund drive held by the Veterans Memorial Health Care Foundation last fall. This drive successfully brought in over $25,000 in funds from Allamakee and Northern Clayton County communities. These new defibrillators are located in each city police department in the Veterans Memorial Hospital coverage area, all Allamakee County Sheriff’s vehicles, and the ER of Veterans Memorial Hospital in Waukon as well as several other locations that were noted as high risk areas in need of the devices. These defibrillators are part of the new Community Cardiac Arrest Specialty Team (CCAST), which was initiated in the community 2 years ago. This team responds to every cardiac arrest reported in the area. The team brings all equipment and performs any initial care needed at the scene instead of waiting until the victim arrives at the hospital, which makes a big difference in rural areas like these. Communities that implement teams like CCAST raise survival rates from 3% to 25%. This team’s survival rate since beginning has been an astounding 75%, proving how beneficial these teams are in communities. The new equipment deployments were celebrated May 13, 2014, at Veterans Memorial Hospital in Waukon, with the AED recipients including: Brian Berger of Monona Police Department; Clark Mellick – Allamakee County Sheriff; Barry Olson – Allamakee County Deputy; staff of Veterans Memorial Hospital (VMH); VMH Foundation staff and Board members; and Jeff Mitchell, VMH EMS Chief. 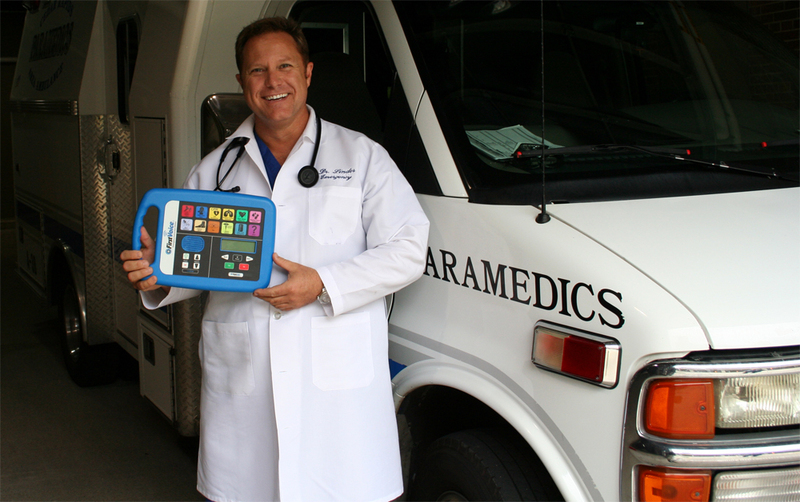 AED devices are a critical component in increasing survival rates among sudden cardiac arrest (SCA) victims. SCA is the leading killer in the United States and claims over 300,000 lives annually in the United States alone; more people every year are killed by SCA than by cancer and strokes combined. The key to fighting SCA is defibrillation (use of an AED) within a very short period of time from the onset of SCA. The statistics show that for every minute that passes there is a 10% decreased chance of survival. 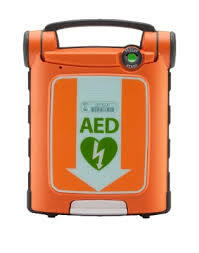 AEDs allow for defibrillation during the initial minutes after 9-1-1 EMS has been called, those critical early minutes make all the difference between life and death during SCA events. The Philips AEDs were sourced from a well-established industry integrator and wholesaler, Think Safe. Think Safe has been providing life saving equipment and training for over 10 years, all over the world, and is headquartered in the Cedar Rapids metro area. 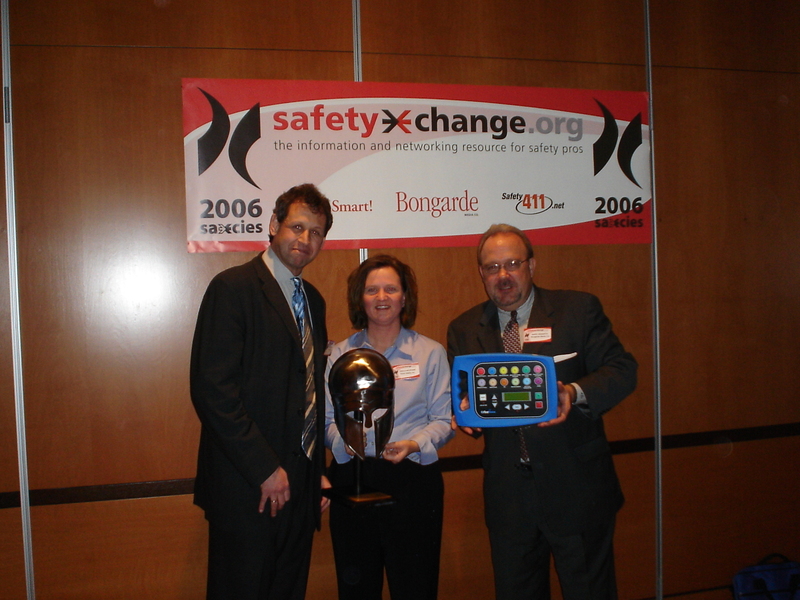 Think Safe is an innovator in the first aid industry and holds various proprietary patents as a manufacturer of First Voice first aid hardware and software products. 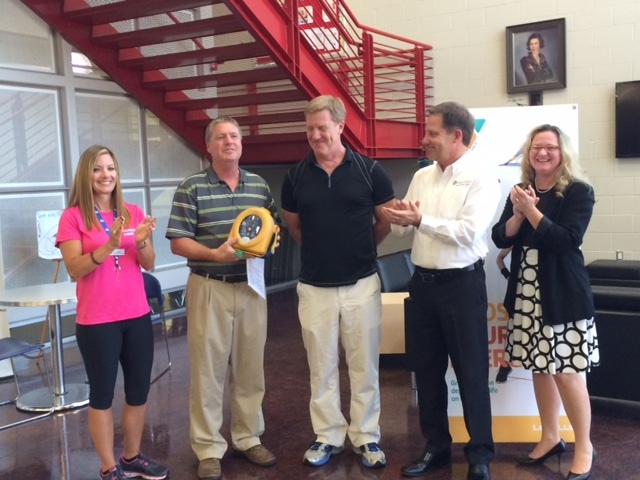 Think Safe has seen the value of implementing AEDs and the lives that can be saved by them. New lifesaving stories can be regularly viewed on their website or Think Safe Blog. Think Safe is dedicated to the fight against SCA and gladly offers AED grants or contributing donations to help offset the costs of lifesaving devices. Sudden cardiac arrest (SCA) is a condition in which the heart suddenly and unexpectedly stops beating, causing blood to stop flowing to the brain and other vital organs. SCA usually causes death if it’s not treated within minutes.CPR alone will not restart the heart, so the American Heart Association recommends CPR combined with early defibrillation (within three to five minutes) for the best outcome. According to the Centers for Disease Control and Prevention (CDC), SCA claims more than 300,000 lives annually in the U.S. alone. It occurs abruptly and without warning, with 84 percent of SCA events occurring outside of the healthcare setting. Think Safe, Inc. is committed to bringing technology into the field of emergency readiness and response. Think Safe provides products and services that improve access to first aid and emergency training and improve emergency response outcomes. Think Safe is based in Cedar Rapids, Iowa. To learn more about Think Safe and its products or services, please visit www.firstvoice.us or follow Think Safe at Facebook, Twitter, and their Blog. For more information on SCA, AEDs, or our grant program fill out the form below.